Help Brig. Gen. John W. McElroy get a new tombstone. Greetings friends! The Col. John B. Palmer Camp of the Sons of Confederate Veterans has embarked on a new project. John W. McElroy, a native to Yancey County, needs a new tombstone, and the Palmer Camp has taken it upon themselves to raise the funds to purchase this stone. Life in western North Carolina was hard during the Civil War years. No one understood that better than John W. McElroy. The McElroy family were prominent citizens in the early days of Yancey County. John W. McElroy was a merchant, dealt in real estate, and served as clerk of court. The economic crisis of the late 1850s had forced McElroy out of business. He had sold his fine Burnsville home, and had moved to the Jack's Creek area to farm. Prior to the War, McElroy had served as the commander of the Yancey County militia. Every county in North Carolina had a militia regiment, required by law to meet once a year to drill. Each county was composed of several militia districts, each with its own captain and lieutenants. These militia districts, found first on the 1860 census, would become townships by the 1870 census. During the first months of the War, Colonel McElroy continued to perform his normal militia duties, which often did not amount to many responsibilities. But he had fewer and fewer men as they left to join the regular Confederate army. In the spring of 1862, the Confederate government passed the Conscription law, requiring men between the ages of 18 and 35 to enlist in the army. McElroy was responsible for mustering the militia and for getting these men off. But many resented having to serve. Some hid out from the beginning, while others joined the army, and then later slipped back to check on their families or to join those already evading local authorities. Governor Zebulon B. Vance tried to use the militia to round up the outliers, but ran into legal problems. So Vance created the Guard for Home Defense. Their chief duty was to curtail the deserter problem. To lead the First Brigade of North Carolina Home Guard, Vance tapped John W. McElroy. While McElroy had limited military experience, Vance probably chose McElroy because of a family connection. Vance's older brother Robert had married McElroy's daughter, Harriett. McElroy's task was not easy. Huge bands of deserters roomed the mountains, using their remoteness to their advantage. Of course, the only way these men could survive was by stealing what they needed. McElroy's command encompassed all of western North Carolina. He often made his headquarters in Mars Hill, using the buildings of the fledgling college. In April 1864, dissidents under Mont Ray raided Burnsville. They were driven out by Confederate forces from Asheville, and as local ledged has it, McElroy's old house was used as a hospital. McElroy then returned for a short time to Burnsville, possibly using his old home as his headquarters. It is believed that at some point during the war, McElroy's home on Jack's Creek was ransacked and burnt. After the war ended, McElroy made his way to Graham County, where he died in 1886, interred in the Old Mother Cemetery. Recently, it came to the attention of the Col. John B. Palmer Camp. Sons of Confederate Veterans, that the tombstone marking McElroy's grave was in poor condition. At some point in the past, the stone had been broken, and then cemented back together. The Palmer Camp chose to take the steps to get McElroy a new stone. Since McElroy was a state-appointed officer, and not a regular Confederate soldier, he is not eligible for a stone from the Veterans Administration. The Palmer Camp has decided to purchase a stone to mark McElroy's grave and is seeking donations to assist in procuring the stone. Donations may be sent to PO Box 317, Micaville, NC 28755. After the stone returns from the stone cutter, the Palmer Camp is planning a memorial service in Graham County for John W. McElroy. An announcement will be posted with this information when the time and date have been set. We had a great time this past Saturday talking about Watauga County and the War. 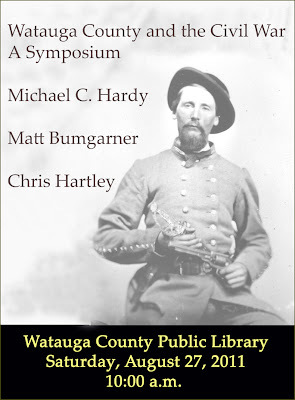 Chris Hartley, author of the new book on Stoneman's Raid, did a great job covering the events in and around Boone and Watauga County, while also setting the events into a greater context. Then it was my turn: instead of focusing on Watauga County and the War as a whole (which I have done in the past), I chose to follow just two local men around. The two I chose to follow were Franklin and William Henry Cousins ( also spelled Cozzins). These two brothers both served in the 37th North Carolina Troops. Franklin was killed in the fighting at Second Manassas in August 1862, and William Henry as captured on April 2, 1865, just outside Petersburg. He survived his brief stay in the Federal prison, and then moved to Yancey County after the War. The truly remarkable part of this story is that both men were "free persons of color" - some of those elusive black Confederates. 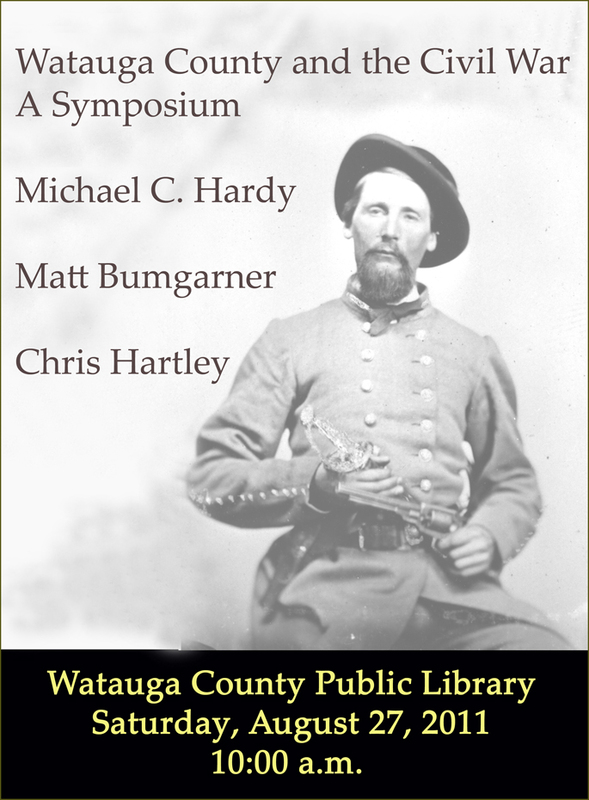 I'll be speaking again in Watauga County at the library on September 20. The topic will be my new book, North Carolina in the Civil War. I hope you can make it. I will confess - I've been doing some type of program about the Watauga County area at the library in Boone for over a decade now. I recently came across something that I clipped from the newspaper from 1998. I know I've written a lot about Watauga County in the past - of all the North Carolina counties, I probably know more about the war in Watauga than in any other county (Avery comes a close second). While my direct line had already passed on to Kentucky by the 1860s, I am related to large portions of the population. My Hardy line and the Council line had already mingled (some say three times) before the Councils came to the area and my Hardys went to Alabama. I'm also related to the Proffits, Hamptons, and Laws families, all early settles in Wilkes County. Over the years, we've done a variety of different programs - lectures, displays of clothes and weapons, and round table discussions. This year, I thought I would put together other writers whose work has touched on the area. Matt Bumgarner wrote a book a few years ago entitledKirk's Raiders: A Notorious Band of Scoundrels and Thieves. This book is a history of the 2nd and 3rd North Carolina Mounted Infantry. Chris Hartley is the author of not only a biography on Brig. 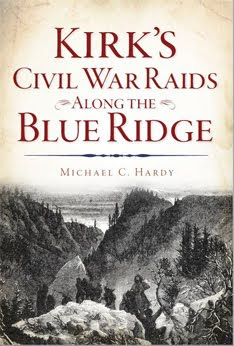 James B. Gordon from Wilkes County, but more recently, a great study of Stoneman's Raid, which passed through Watauga County in March 1865. 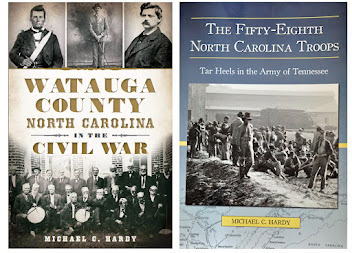 Of course, I've written histories of the 37th NCT and the 58th NCT (both of which had large amounts of men from Watauga County) and a history of Watauga County itself. The program starts at 10:00 am, and there will be ample time to ask questions. And I am sure there will be a few books for sale. It is rare for me to be without a contract for some type of book. I mean, I turn in one manuscript, and often before I have proofs back, I am already working on something else. So for the past couple of months, I've not had a contract - that is not say that I've not been working. The History Press has a very quick turnaround time, weeks, as compared to months like some other publishers. I turned in North Carolina in the Civil War in May, and it was released on July 29. Writing North Carolina in the Civil War has shown me some serious gaps in the coverage of our fair state when it comes to reading about the war. There are significant counties and cities that have no easily accessible War-related histories, and you are probably tired of me griping about the lack of regimental histories. 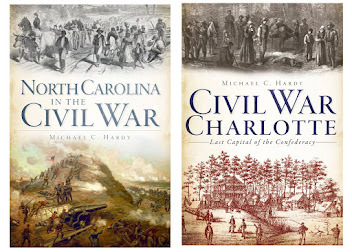 A couple of weeks ago, I submitted a proposal to The History Press, who published North Carolina in the Civil War. 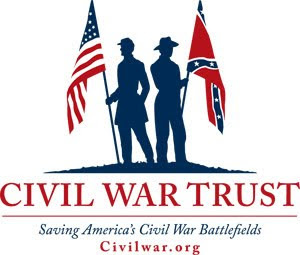 The new project, which they accepted and for which I signed the contract this past weekend, is for book tentatively titled Civil War Charlotte. I have come to the conclusion that there is no other more important city in North Carolina during the War than Charlotte. Yes, I know Wilmington had the port, the last remaining port open to the Confederacy. Yet Charlotte had the Confederate Naval Works, a gunpowder making facility, uniform making facilities, the Confederate Acid Works, other facilities that made war goods, hospitals, ladies aid societies, and toward the end of the war, a prison. Of course, Jefferson Davis was in Charlotte (along with other refugees) at the close of the war, as was the Confederate gold, Confederate cabinet, and surviving papers of the Confederate War Department. Plus, the railroad that ran through Charlotte was, after mid-1863, one of the most important railroads for funneling supplies from the Deep South to the main Confederate army in Virginia. So there you have it: my next project will be on Charlotte, North Carolina, during the War for Southern Independence. I came up with an idea last night - how did the rest of the country perceive North Carolina's secession struggle. Here are some newspaper articles that I dug out. These are from the month of March 1861. I plan to go back and look at May 1861 next. "Our returns from North Carolina are too meager to indicate the result yesterday, whether for Union or secession. Raleigh gives a splendid vote in favor of the constitution as it is." - 01 March 1861 Springfield Republican (MA). "North Carolina. - The result of the North Carolina election may remain in doubt for some days, but the returns, so far as yet received, seem to us to be favorable, and to show a probability that no convention will be held. A glance at the map and at former election returns will show that we are hearing from the worst part of the State first, --that is, from the counties near the coast and in the southern part of the State. This, New Hanover seems to have voted for a convention by about the same majority which it gave to Breckinridge; Duplin seems to have gone for a convention, and gave Breckinridge over 1200 majority; Brunswick, a small county, and usually nearly balanced, it is reported to have voted for a convention, which is a gain to the wrong side. The chief county in the interior which has been heard from is Wake county (containing Raleigh), which, instead of 86 majority for Breckinridge over Bell (Douglas having 276 votes), now gives 1000 majority against a convention, and Wayne, somewhat nearer the coast, votes for a convention by rather less than Breckinridge's majority. "The returns from the coast, as we anticipate, will be unfavorable, but in the interior and western parts of the State, the Tennessee feeling is very strong, and we anticipate there such noble majority against disunion as those by which Eastern Tennessee swamp the secession majority of the western part of that State. A few counties like will turn the scale, for in the State Breckinridge had only 3549 majority over Bell, 2701 votes being cast for Douglas." 2 March 1861 - Boston Daily Advertiser. North Carolina for the Union for the Union- Convention Rejected. "The returns received, says the Raleigh Register, warrant us in asserting that North Carolina has gone for the Union by an overwhelming majority, and in expressing the opinion that a majority of the people have refused to call a convention, and this, we believe, is the general impression herel for a though by our returns as published to-day, the Convention is ahead, there are counties yet to hear from, which it is believed, will turn the scale the other way. "The result of the election shows the devotion of North Carolina to the Constitution and the Union of the States, and her utter detestation of the policy of the Ellises, Averys, the Persons, the Hokes, the Thomases, et id omne genus, which would have carried the State out of the Union and tacked her to South Carolina two months ago. But North Carolina's action on Thursday last must not be misconstrued into anything savoring of a declaration that she will submit to anything and everything for the sake of a so-called Union. To place such a construction on her action would be to make a great mistake. "North Carolina declares that she has seen nothing as yet to justify the destruction of the Union, or make her turn her back on the blessings which she thinks she has enjoyed and is enjoying in it. This is what she has declared. But should the time unhappily come when the Constitution, which supports that Union, is so perverted that the rights which she contracted for are not recognized and respected, her action will be in accordance with the spirit which prompted her sons in 1775 to be the first on this continent to declare the great principles of human liberty. " - 8 March 1861 Philadelphia Inquirer. "North Carolina.-If any body has entertained the idea that North Carolina would follow the bad example of her more Southern namesake, and declare her connection with the Union severed, that idea will now probably be dispelled. A telegram from Raleigh informs us that the State has voted against holding a convention by one thousand majority, and that the delegates elected to a Convention in case one had been ordered are two to one for the Union. - North Carolina has been confidently counted upon for secession, and her adherence to the to the Union is a gratifying evidence that the disunion movement has been effectually checked." 11 March 1861 Trenton State Gazette (NJ). Why does no one remember Samuel Cooper? I had a great time signing books and speaking at the Bentonville Battlefield this past Saturday. A conversation with one of the patrons led me to this question: why does no one remember Samuel Cooper? Ask the common rank and file on the streets who the highest ranking Confederate general was, and you usually get one, maybe two answers. Most people say Robert E. Lee. A few will say Joseph E. Johnston. Neither is right. The highest ranking Confederate general was Samuel Cooper. Born in Dutchess County, New York, in 1798, Cooper graduated from West Point in 1815. He served in the artillery until 1837, when he became chief clerk at the War Department. After that he served as Assistant Adjutant General, until July 1852, when he was promoted to Adjutant General. For three days in March 1861, Cooper was Secretary of War ad interium. Cooper resigned from the United States Army on March 7, 1861, and a few days later, appointed Adjutant General and Inspector General of the Confederate Army. His appointment as a full general in the Confederate Army was dated May 16, 1861. Cooper died on December 3, 1876, and is interred at Christ Church Cemetery, Alexandria, Virginia. The other ranks of the other top five Confederate Generals: Albert S. Johnston's commission as a full general dated to May 30, 1861; Robert E. Lee - June 14, 1861; Joseph E. Johnston - July 4, 1861; and, P. G. T. Beauregard - July 21, 1861. 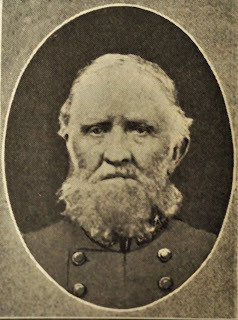 Of course, many of you are familiar with the story of Joseph E. Johnston, upset that he was not the highest ranking Confederate general, based upon his being promoted to quartermaster general in the regular army a year prior to the war. So, what does this have to do with North Carolina and the War? In the last days of the conflict, as Jefferson Davis fled south into North Carolina, his cabinet followed him. Cooper traveled as far as Charlotte. When Davis chose to continue further south, Cooper, being 67 years old, chose to remain behind in Charlotte, supposedly watching over the papers of the War Department. Cooper was paroled in Charlotte on May 3, 1865. So there you have it. The highest ranking Confederate general. FOUR OAKS -- Bentonville Battlefield will present “A Patchwork of History: Quilts, Soldiers, and North Carolina ’s Civil War Sacrifice” at the free 2nd Saturdays program on Aug. 1 3, 10 a.m.-4 p.m. Topics will include 19th-century quilts and textiles, North Carolina ’s Civil War Death Study and the 58th NC Troops. Visitors will enjoy music by Waterbound Dulcimers of Kinston throughout the day. 11 a.m. 19th Century Quilts and Textiles. Textile historian and conservator Lynn Lancaster Gorges of New Bern will present a detailed history of quilts and textiles production prior to the Civil War. Learn about the most popular quilt patterns and fabric colors found in the possession of a soldier or on the home front during the war. Following the presentation she will be available to evaluate quilts and textiles bought in by visitors. Visit her Web site at www.textilepreservation.com. Quilts of the 19th century will be on display. 1 p.m. North Carolina’s Civil War Death Study. N.C. Office of Archives and History Research Historian Josh Howard has painstakingly re-examined official military records, and records from hospitals, cemeteries, churches, prisoner-of-war camps, as well as news paper accounts, letters, diaries, and census info rmation, to establish the first official count of North Carolina’s Civil War dead. Learn about his research journey and surprising findings! For more info rmation, visit www.nccivilwar150.com. 3 p.m. The 58th NC Troops. 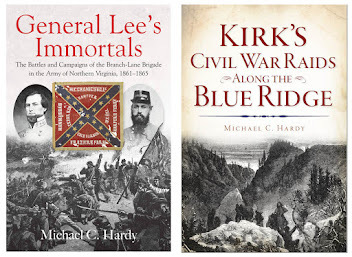 Civil War historian and author Michael C. Hardy will present info rmation on the 58th NC Troops, one of the few North Carolina regiments that served in the western theater (from Alabama to Kentucky ) of the Civil War. 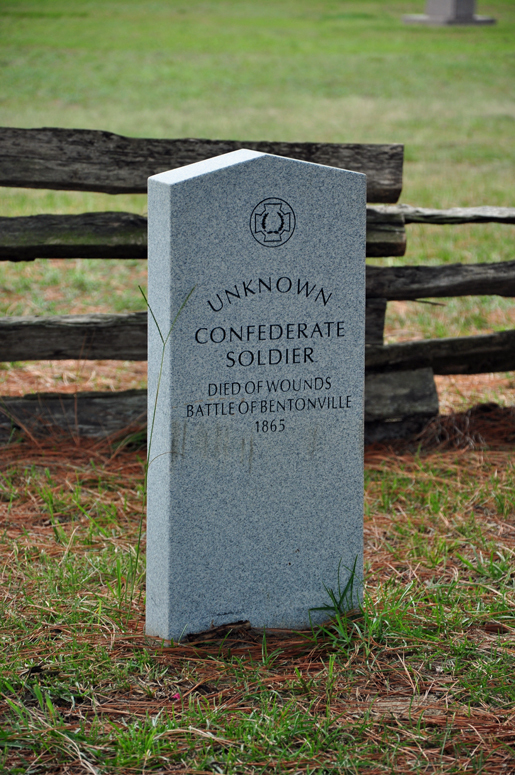 The 58th was in Palmer’s Brigade with remnants of the Army of Tennessee at Bentonville on March 19-21, 1865. Hardy will sign and sell books throughout the day. 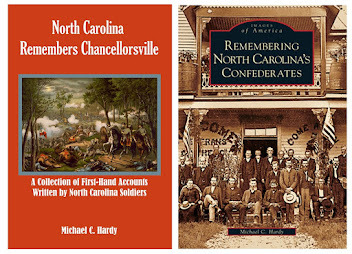 For info rmation on the award-winning North Carolina historian visit www.michaelchardy.com. The Battle of Bentonville involved 80,000 troops and was the last Confederate offensive against Union Gen. William T. Sherman. 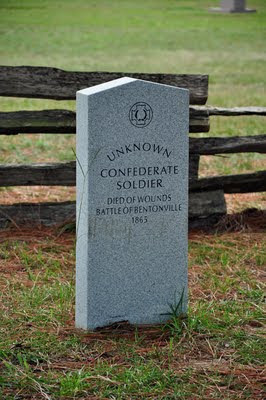 Bentonville Battlefield is located at 5466 Harper House Road , Four Oaks, NC 27524, three miles north of Newton Grove on S.R. 1008. For more info rmation, visit www.nchistoricsites.org/bentonvi/bentonvi.htm or call (910) 594-0789. Bentonville Battlefield State Historic Site is part of the N.C. Department of Cultural Resources, the state agency with the mission to enrich lives and communities, and the vision to harness the state’s cultural resources to build North Carolina ’s social, cultural and economic future. 2nd Saturdays is a series of more than 100 free events that bring together artists, history and authentic North Carolina culture at all 37 of the Department of Cultural Resources’ museums and Historic Sites. For more info rmation on Cultural Resources, visit www.ncculture.com. Folks, I'll be speaking tonight in Clyde, North Carolina (at the Fire Department) at 7:00 pm, to Haywood County's Sons of Confederate Veterans Camp. On Thursday August 11, I'll be moderating the Mitchell County and the Civil War Round Table. It will be held at the public library in Spruce Pine at 6:30 pm. On Saturday, August 13, I'll be signing books and speaking at the Bentonville Battleground visitor center. I'll be there all day, and speaking at 3:00 pm. I hope if you are in one of these areas, you will drop by and say hi! Paul Chrisawn asked a series of questions. His first was: "Which North Carolina soldiers or leaders stand out as having the most success and influence after the war was over." Zeb Vance would probably top that list. While the Reconstruction years were rough - never knowing if you could be arrested at any moment and tried for treason, struggling law practice in Charlotte, Vance was able to eventually rise again, served as governor of our fair state, and then as US Senator for three terms. I'm sure that there are others, but Vance kind of stands above the rest.
" Your favorite North Carolina war site to visit and why?" Yet another hard question - Out of state? Probably Snodgrass Hill where the 58th NCT fought, or maybe the Sunken Road at Sharpsburg where the 4th and 14th NCST fought, or maybe Spotsylvania Court House, near the marker where the 17th Michigan is - that is where the 37th NCT saved the ANV for the second time in one day. I've written about many of these sites, and I've walked many of these site. I often try and take their letters with me and read them on the spot, trying to see, at least geographically, what they saw. In the state: I see the war everyplace in North Carolina - standing on the Blue Ridge Parkway overlooking the Globe area of Caldwell County; on the Bentonville Battlefield; or, among the remains of Ft. Fisher. If I am out in the field, with maps and letters and camera in hand, it is my favorite spot. Matt Bumgarner asked: "What do you think would have happened had the idiot governor of SC waited a mere 3 days more for Ft. Sumter to have been given up voluntarily due to dwindling water and rations? It was Gov Ellis who used Lincoln's call for troops to march upon SC to rally the state for secession. I wonder what might have been had the shots on Sumter not actually occurred." I believe that by 1861, the war was bound to break out at some point. Remember, it almost started in Pensacola, Florida, in January 1861, and cooler heads prevailed. So if it is not Charleston in April 1861, maybe it is Pensacola in May 1861, or Fortress Monroe in June 1861. For the people who made most of the political decisions, their bridges were already burning behind them in the spring of 1861. My darling Elizabeth asked: " What is your favorite/least favorite part of the writing process and why?" Well, I love the researching process the most - finding out these neat, little stories that have lain hidden for so many decades. And I really like the writing process, of putting all these things together. I do like meeting people and hearing their stories. I terribly dislike the traveling - pulling in all hours of the night, hotel rooms, etc., etc. Why do I dislike it? - I would really rather be at home. Sandy Nutter asked: "Are you interested in researching/writing books on other historic battles, such as World War 2, or Vietnam?" The easy answer would be yes, and no. I have written about other time periods - I've been writing a series on local or High Country history for Carolina Mountain Life. These articles have ranged from the late 1700s to yesterday. One difficulty in writing in-depth about, say D-Day or the Tet offensive would be the learning curve. I have almost 30 years of interest/travel/experience behind me when I write about the Civil War. How long would I need to read and study on Vietnam in 1969? Here is another example. 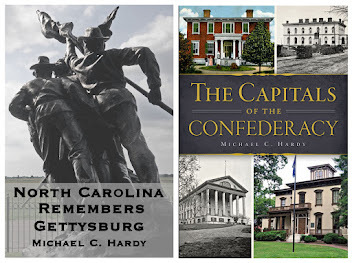 Even though I have written several books on different aspects of North Carolina and the Civil War, when it came time to start seriously working on North Carolina in the Civil War, I did nothing but read and take notes for six months prior to putting pen to paper. And I continued to read books and articles while I wrote. Barbie Russ wants to know: " What has been your most exciting 'find' in your research? You know: the 'find' that you are so excited about that it kept you awake that night just thinking about it.........." There are several - finding the John B. Alexander letters at UNC-Charlotte caused me to rewrite several chapters of the book on the 37th North Carolina Troops. There were a lot of great finds with the battle of Hanover Court House project and the history of the 58th North Carolina Troops. One great "experience" was talking about the 1929 National United Confederate Veterans reunion in Charlotte, and meeting a man in the audience who was there -as a boy scout helping the old vets around town. David Long inquires: " What has been your greatest challenge so far as one particular person that you have studied?" Biggest challenge - why did John B. Palmer, New York native, Detroit, Michigan, businessman, and colonel of the 58th NCT, move to present-day Avery County in 1858. I know so much about his life, yet this one piece of information escapes me. Autumn Miner sent several questions. Her first was: " If you could choose one thing to change about the historical community, what would it be? How would that affect scholarship and the general public's reception of and participation in it?" Two things: I would do away with political correctness. It hurts the historians' work because they are afraid of hurting someone's feelings. Well my friend, all history is offensive to someone: my Scottish ancestors did not think too highly of the English, and my Native American ancestors did not think too highly of the United States. The second thing I would change would be this whole academic snobbery issue. Since I don't have a Ph.D , and don't write for that academic crowd, does that make me any less of a historian? For some, yes it does. But for those I write for, those in the communities, or who had ancestors in the regiments I write about, I am much more a historian than those far away in the hallowed halls of academia. Given those two answers, I leave you to figure out that follow-up question. David Long asks: "What were the ramifications for the people of Western North Carolina, following the Confederate Conscription act of 1862?" I think the real ramification is this: the Conscription Act left North Carolina almost defenseless. All those who were willing to serve, and a few who were unwilling, were all drawn away to fight. In many cases, only the riff-raff was left, and the civilian population suffered. RALEIGH – On Saturday, Aug. 13, the Capitol will host a lecture by Suzy Barile, author of “Undaunted Heart: The True Story of a Southern Belle & a Yankee General.” The free lecture takes place at 1 p.m. in the historic Senate Chamber, the final event in this summer’s 2nd Saturdays series. At the end of the Civil War, spirited Ella Swain – daughter of a former N.C. governor and University of North Carolina president – shocked citizens across the state when she fell in love with and married the Union general whose troops occupied Chapel Hill . Barile draws on Ella Swain’s never before published letters that reveal a love that transcended outrage and scandal. Barile, who lives in Cary , is the great-great-granddaughter of Ella Swain and General Smith Atkins. She will discuss her research and the process of separating fact from fiction in writing the true story of this infamous North Carolina romance. The lecture is part of the N.C. Department of Cultural Resources’ 2nd Saturdays statewide summer programming series, which showcases North Carolina ’s culture, heritage and arts. Partners in 2nd Saturdays include “Our State” magazine and AT&T, with media sponsorship provided by Public Radio East. For a complete schedule of 2nd Saturdays programs across North Carolina , go to www.ncculture.com or call 919-807-7385. The State Capitol’s mission is to preserve and interpret the history, architecture and functions of the 1840 building and Union Square . The Capitol is bounded by Edenton, Salisbury , Morgan and Wilmington streets. For more info rmation on this national historic landmark, visit www.nchistoricsites.org/capitol/default.htm or call (919) 733-4994. Administered by the Division of State Historic Sites, the State Capitol is part of the N.C. Department of Cultural Resources, the state agency with the mission to enrich lives and communities, and the vision to harness the state’s cultural resources to build North Carolina ’s social, cultural and economic future. Information on Cultural Resources is available 24/7 at www.ncculture.com. Friends - some scheduling changes. Instead of working as a interpreter this morning and afternoon at the Festival in Burnsville, I'll be at the Avery County Museum from 1:00 pm until 4:00 pm. Tomorrow (Saturday) is still the same - I'll be at the Orchard at Altapass from 1:00 pm until 3:00 pm. Sunday's program at the old Courthouse in Bakersville has been postponed. DURHAM –Authors will share engaging tales as banjo players and soldier re-enactors surround the grounds of Bennett Place State Historic Site in Durham the weekend of Aug. 13-14. Writers Stewart Dunaway, Myron Miller, Keith Jones and others from across North Carolina will offer a variety of talks on the history and culture of the Old North State . Music, musket firings and other living history demonstrations are highlights of the free program on Saturday, Aug. 13, from 10 a.m.-4 p.m. and on Sunday, Aug. 14, from 10 a.m.-3 p.m. The 6th North Carolina Infantry, Cedar Fork Rifles Company, will encamp on the grounds and share their re-enactment experiences in the recent commemoration campaign in Northern Virginia . Nationally known musician Joe Ayers, who performs 19th-century banjo music, will play throughout the day and in concert in the visitor center theater Saturday from 7-9 p.m. Concert tickets are $15 and can be purchased in advance at the visitor center. The N.C. Department of Cultural Resources is presenting the 2nd Saturdays gas-tank-get-away events (www.ncdcr.gov/2ndSaturdays.asp) at 37 state historic sites and museums statewide through August. In April 1865, the Bennett Farm was the site of the largest surrender of the American Civil War. Confederate Gen. Joseph E. Johnston and Union Maj. Gen. William T. Sherman met at the Bennett farmhouse to negotiate a solution to America ’s most tragic war. The surrender ended fighting in North and South Carolina , Georgia , and Florida , allowing 89,270 exhausted Confederates to return home. The mission of Bennett Place is to preserve and interpret the history of the largest Civil War surrender and the lives of yeomen farmers such as the Bennetts. Follow the observance of the 150th anniversary of the end of the Civil War at www.nccivilwar150.com. Bennett Place is at 4409 Bennett Memorial Road in west Durham . From Raleigh take I-40 west to the Durham Freeway (Hwy. 147) exit to Hillsborough Road , then follow the brown historic site signs. From Greensboro take I-85 north to Exit 170 to Hillsborough Road , then follow the brown historic sites signs. For further info rmation call (919) 383-4345, e-mail Bennett@ncdcr.gov, or visit www.nchistoricsites.org/bennett.bennett.htm. 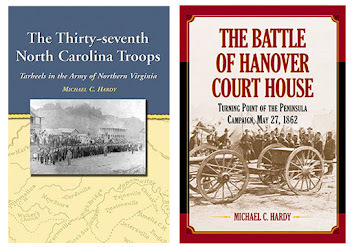 This 2nd Saturdays program will feature guest speakers Lynn Lancaster Gorges (11 a.m.) of the Historic Textiles Studio in New Bern, Josh Howard (1 p.m.) of the N.C. Department of Cultural Resources, and North Carolina Civil War author and historian Michael C. Hardy (3 p.m.) in the Visitor Center auditorium. Gorges’ specialty is in the area of conservation of military uniforms, flags, vintage clothing and quilts, and she is trained in quilt restoration; she has studied at the Smithsonian Institute, The Campbell Center of Preservation, Schoolhouse Studio of Lawrence, KS, Cooperstown Textile School, NCSU College of Textiles, and Colonial Williamsburg. Howard, a researcher in the N.C. Office of Archives & History, will discuss the ongoing Civil War Death Study and its findings so far (http://news.ncdcr.gov/2011/06/13/historian-re-examines-number-of-deaths-of-states-civil-war-soilders/ ). For more information call the state historic site at (910) 594-0789. The 2nd Saturdays summer programs are sponsored statewide by the N.C. Department of Cultural Resources (www.ncculture.com), combining family fun and the arts with history and cultural heritage at its 37 historic sites, history museums and art museums. The work of friend Josh Howard on the number of North Carolinians who died during the war is still catching the eyes of the press. You can learn more here through this article in the News and Observer. Another article from the News and Observer about a Chatham County soldiers can be found here. The Winston-Salem Journal looks at men from Forsyth County who fought at the battle of Manassas. Click here for more information. An article on North Carolina native (and often maligned) Braxton Bragg and the military base named for him can be found here. Information on a member of the 56th North Carolina from Pasquotank County (along with a great post-war painting) can be found here. Details on the service of a soldier from Haywood County can be found here in the Asheville Citizen-Times. Folks, I'll be on the road quite a bit this week. If you are at one of these events, stop by and say hi! Thursday, August 4, Wilkes County Public Library in Wilkesboro, 3:00 - 5:00 pm. And then, I'll be speaking to the Gen. James B. Gordon Camp of the Sons of Confederate Veterans, which meets at the Elks Lodge in Wilkesboro - 7:00 pm. Saturday, August 6, Orchard at Altapass, off the Blue Ridge Parkway, 1:00 to 3:00 pm. Sunday, August 7, Old Mitchell County Courthouse, 2:00 pm. Everyone welcome.